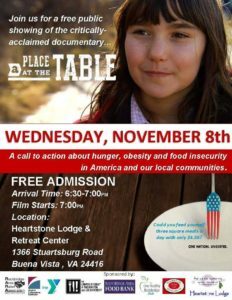 On Wednesday, November 8, join us at the Heartstone Retreat Center in Buena Vista for a free public showing of the critically acclaimed documentary A Place at the Table. Admission is free. Arrive 6:30pm for light refreshments and appetizers provided by Full Circle Catering! The film will start at 7:00pm. This documentary is a call to action about hunger, obesity and food insecurity in America and our local communities. Our goal is to educate as many people in Lexington, Buena Vista, and Rockbridge County about the food insecurity and health challenges that we face in our own backyard. Many local community organizations are partnering together for this event and we hope to see you there!